The Mar Menor (“Small Sea”) is a large salt-water lagoon on the Costa Blanca, separated from the Mediterranean by La Manga, a 21km long sandbar. It is a hugely popular area with families and Spanish nationals, and there is plenty to do in the surrounding area. Here, we’ll look at some of the best places and activities in the region, whether you’re just visiting or thinking of moving. The Mar Menor itself is a salt water lagoon with a surface area of over 170 km². The water never reaches more than 7 metres in depth and has high salinity levels (salt ratio), aiding floatation. The waters are also very calm and relatively warm, due to the lagoon being enclosed (bar some small channels) and separate from the Mediterranean tides. For these reasons, the Mar Menor is considered ideal for a range of water sports, which are very popular in the area. It is common to see all manner of jet-skis, wind-surfers and parasailers out on the water. The shallow depths also allow families with children to enjoy the water. So, hop right in and enjoy it for yourself! Torre de la Horadada is a popular coastal town just north of the Mar Menor with plenty to offer its visitors, with blue flag beaches such as Las Higuericas, El Conde and El Puerto. Pueblo Latino, a traditional Spanish square is a great for an evening visit, with a great variety of lively bars and restaurants surrounding a lovely central fountain. The great atmosphere is also enhanced with regular street performances during the busy summer months. There are also great photo opportunities around the famous watch tower, from which the town got its name. San Pedro del Pinatar is a very popular municipality situated at the northern end of the Mar Menor and bordering Torre de la Horadada. The area is famous for its mud bath locations, where visitors can happily cover themselves in mud in an acceptable setting! Known for its skin benefits and (some say) health benefits, the mud baths are a great visit for those looking for something a little different. If we’re being honest, it’s also just fun to relive your youth and roll around in some mud. There’s also a wide selection of beachside hotels, bars and restaurants if mudding isn’t your thing. La Puntica and Villananitos beaches are both very popular and well worth a visit. Los Alcazares is a former fishing village situated on the western shores of the Mar Menor, boasting over 7km of stunning sandy beaches, many with Blue Flag status, as well as a beautiful promenade. This tranquil spa town is famous for its privileged position overlooking the Mar Menor. The calm waters are always just a stone’s throw away, and with easy access to an array of water sports facilities, you can enjoy sailing, kiteboarding, and jet-skiing to your heart’s content. The town also boasts a wealth of historical architecture and cultural festivals that showcase the colourful costumes of folk dancers, the scent of Murcian tapas and a selection of artisan crafts from across the Region. Region de Murcia International airport is also less than ten minutes away, so getting there is a breeze. 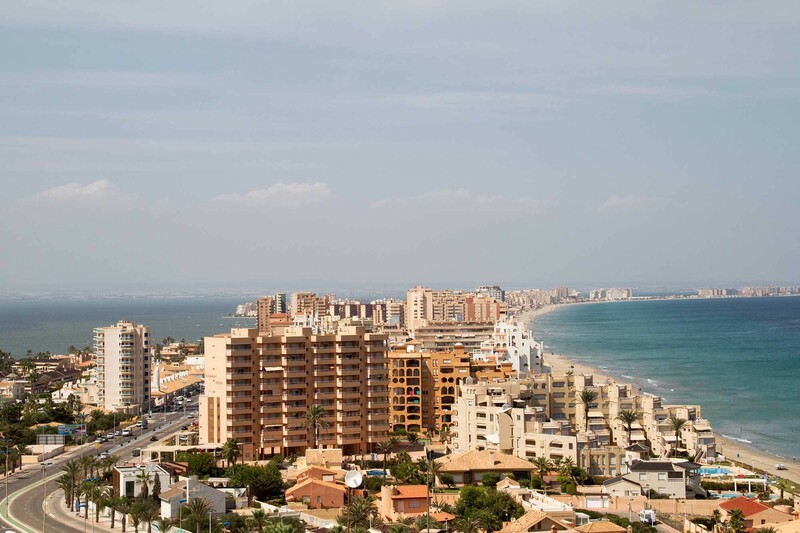 The stretch of land separating the Mar Menor from the rest of the Mediterranean is known as La Manga. It is a 21km long sandbar that is up to 100m wide. A relatively new Spanish tourist destination, it only became urbanised in the mid-1960s when its potential was realised. Since then an array of hotels, restaurants, spas and bars have popped up along its length. As with other resorts surrounding the Mar Menor, water sports are very popular and here, you’ll be in the middle of it all. However, we recommend taking some time out to enjoy a pampering session at one of the many luxury day spas available with fantastic views overlooking the lake on one side and the sea on the other. Bliss. There’s lost more sights and activities to enjoy in and around the Mar Menor, just not enough time to go over them all here! If you’re interested in visiting and seeing for yourself, then get in touch with us to discuss booking a viewing trip. We’ll do the hard work for you and select a portfolio of properties in the area for you to view, leaving you with more time to decide how to enjoy your time when you do move.